ROGERS COUNTY, Okla. -- A man who was escorted out of a meeting about medical marijuana files lawsuit, asking for $75,000 for alleged assault and battery at hands of Rogers County Sheriff's Office. Chip Paul filed a civil lawsuit in Rogers County District Court against Sheriff Scott Walton on Wednesday saying he saw the sheriff come towards him in "a harmful, menacing and offensive manner." He further stated in the lawsuit that Walton came at him with intent of apprehension or immediate harmful and offensive contact. The plaintiff, Paul, claimed it caused him to suffer fright and terror. He claims he was assaulted. Paul stated in the lawsuit that the sheriff grabbed him by the back of the neck, head and throat in an unwarranted, unneccessary and offensive matter (sic), and that he did so by use of unlawful force without his consent. That was his claim of battery. The $75,000 Paul asked for is in excess of the jurisdictional limits, so he asked in the conclusion for a judgment in excess of $10,000, an award of punitive damages against Walton, costs of the lawsuit and attorney fees. 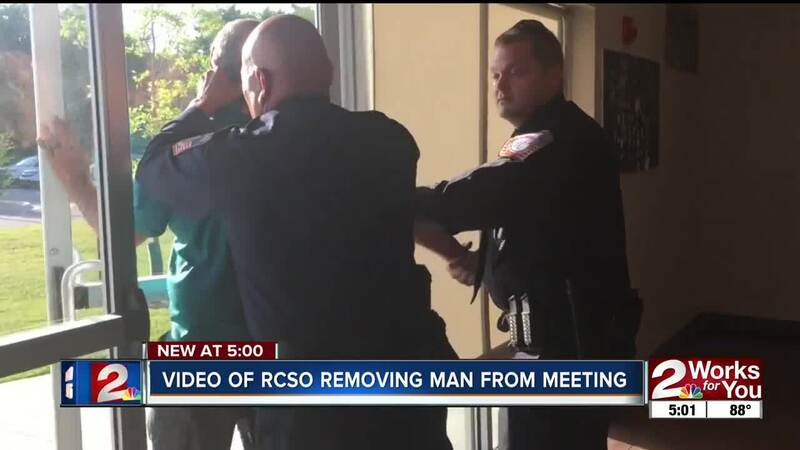 Paul claims his civil rights were violated at the meeting and that his escorting out of the meeting was unwarranted.